Lightning Powder FR-KIT First Response Kit FREE SHIPPING! 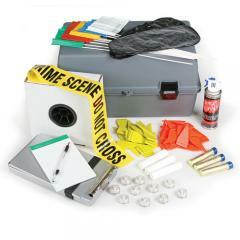 The First Response Kit from Lightning Powder contains everything required to secure a crime scene and mark out evidence. Leaving nothing unaddressed, it even accounts for equipment necessary in low-light conditions, including ten of their popular Evi-Lites® marker lights, as well as 1000-feet of barrier tape for cordoning off the investigation area. Three sticks each of white and reflective marking chalk and a can of red spray chalk allow investigators to draw outlines and highlight areas of interest, while the bright and visible Evi-Paq® First Response Markers and assorted marking flags make it easy to flag pieces of evidence for photographs. The comprehensive kit also includes a large notepad, a citation holder and ballpoint pen for convenient note-taking. ©2002-2019 CopsPlus.com: Lightning Powder FR-KIT First Response Kit FREE SHIPPING!